Thanks to the American Academy of Dermatology, here's the basics on how to apply sunscreen properly. We think we all know, but there's no harm in being reminded!!! 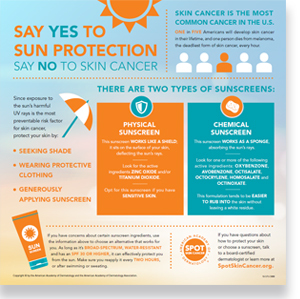 This infographic gives important information on how to protect against skin cancer, including detailing the difference between physical sunscreen and chemical sunscreen. Apply enough sunscreen to cover all exposed skin.Most adults need about 1 ounce — or enough to fill a shot glass — to fully cover their body. Rub the sunscreen thoroughly into your skin. To remain protected when outdoors, reapply sunscreen every two hours, or immediately after swimming or sweating. People who get sunburned usually didn't use enough sunscreen, didn't reapply it after being in the sun, or used an expired product. Your skin is exposed to the sun's harmful UV rays every time you go outside, even on cloudy days and in the winter. So whether you are on vacation or taking a brisk fall walk in your neighborhood, remember to use sunscreen. For more skin cancer prevention tips, see a board-certified dermatologist. Your skin is exposed to the sun's harmful UV rays every time you go outside, even on cloudy days and in the winter. So whether you are on vacation or taking a brisk fall walk in your neighbourhood, remember to use sunscreen.